Saudi Aramco, the world’s largest oil company, has received $60 billion in orders for its debut bond sale, kickstarting an offering with yields likely to fall in line or below Saudi Arabia’s sovereign debt. It’s rare for bonds of a state-owned company to yield less than the sovereign debt and the demand reflects intense investor appetite for high-quality paper. For Saudi Arabia and Aramco itself, the early success in selling the bonds marks a tremendous turnaround after investors, Wall Street bankers and corporate titans briefly shunned the kingdom last year following the assassination of journalist Jamal Khashoggi. The crisis, along with sliding crude prices, hit the kingdom late last year and in early 2019, with the economy slowing down and investors taking money out of the local stock market. Now, the situation appears to be reversing, helped by oil rising to more than $70 a barrel, up from $50 in December. As part of its debut in the global debt market, Aramco has offered bonds in six portions, from three to 30 years, according to the people familiar with the matter, who asked not to be identified because the information is private. 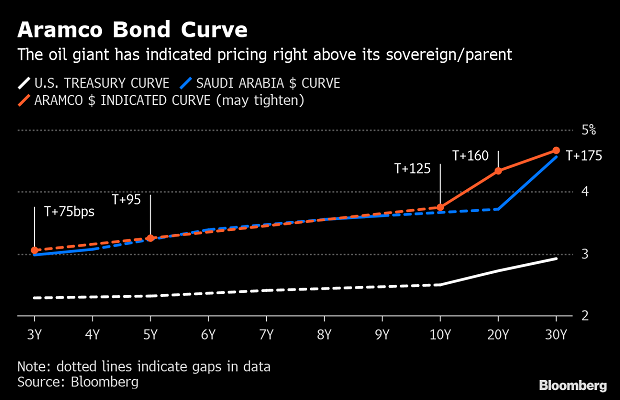 The company expects to pay about 1.25 percentage points more than U.S. Treasuries for its 10-year notes, compared with Saudi bonds trading at about 1.27 percentage points, the banks selling the debt told investors. Traditionally, those risk premiums fall in a high-demand bond sale as the process advances, suggesting Aramco may pay even less. 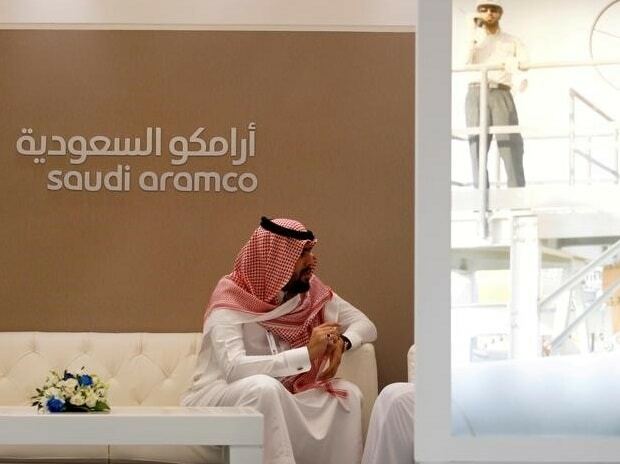 Aramco is likely to raise between $10 billion and $15 billion, with final pricing and size expected on Tuesday afternoon London time. The Aramco deal is one of the most hotly anticipated debt deals of the year, marking the first time the Saudi oil giant has tapped the international bond market. When Qatar, a rival Middle East nation, sold $12 billion in bonds earlier this year, it got a record $50 billion in orders, evidence of investor appetite for debt of rich, oil-producing nations. The order book for Aramco expanded from about $40 billion when the deal kicked off earlier Monday, people with knowledge of the deal said. The deal is largely seen as Plan B to raise money for the country’s economic agenda after the initial public offering of Aramco, which had been slated for 2018, was postponed until at least 2021. In effect, Saudi Crown Prince Mohammed bin Salman is using the company’s pristine balance sheet to finance his ambitions. Aramco has lined up a roster of international investment banks supporting its jumbo bond deal, which suggests the mood around dealing with Saudi Arabia is changing as the impact of the Khashoggi crisis ebbs. The banks not only want to participate on the bond sale, but also ensure they’re well placed in case the kingdom goes ahead with an initial public offering for Aramco. This isn’t the first time Saudi Arabia has turned to debt markets since the death of Khashoggi. In January, the nation sold $7.5 billion in international bonds, showing that the outcry hasn’t stifled foreign investment in the country. JPMorgan is managing the bond sale along with Morgan Stanley, Citigroup Inc., Goldman Sachs Group Inc., HSBC Holdings Plc, and NCB Capital Co. The bond sale, being pitched to investors over the last week in a global roadshow from Tokyo to New York and London, has forced Aramco to reveal financial secrets held closely since the company’s nationalization in the late 1970s, casting a light on the relationship between the kingdom and its most important asset. Both Fitch Ratings and Moody’s Investors Service assigned Aramco the fifth-highest investment-grade rating, the same as Saudi sovereign debt, but lower than oil majors Exxon, Shell and Chevron Corp. The state-owned company generated the most profit of any corporation in the world in 2018 with income of $111.1 billion -- more than Apple Inc., Google’s parent Alphabet Inc. and Exxon Mobil Corp. combined. But accounts published before the firm’s debut in the international bond market also show Aramco -- an organization that produces about 10 percent of the world’s crude -- doesn’t generate as much cash per barrel as other leading oil companies like Royal Dutch Shell Plc because of a heavy tax burden. Aramco is raising money as bond investors search for higher yields. Emerging-market bond sales have made a record-breaking start to the year, with issuance among all currencies already climbing above $600 billion, according to Bloomberg league table data. The company plans to use some of the proceeds of the bond sale to pay for the $69 billion acquisition of a majority stake in local petrochemical company Sabic from the country’s sovereign wealth fund. The deal between three government-owned entities -- where the kingdom’s sovereign wealth fund sells its 70 percent stake in Sabic to Aramco -- moves money from one pocket of the state to another.